Megan Shreve, CEO, South Central Community Action Programs, Gettysburg, Pennsylvania talks housing on this episode of the Seminary Explores. The “Wage Gap,” perhaps the most significant contribution to the housing crisis, occurs when a working family on minimum wage does not qualify for aid, but doesn’t have enough to cover the necessities of food, health, transportation, and child care. In addition, declining resources from state and federal governments are threatening even the most basic programs such as overnight shelters. SCAAP has created two innovative, and biblical, programs that involve community resources. “Support Circles” provide dinner and child care as well as action strategies to rise out of the gap. “Gleaning” allows families to harvest agricultural products that growers can’t market. Dr. Dennis Onieal discussed the events of 9/11 as a first responder. the former head of the Jersey City Fire Department and currently Deputy U.S. Fire Administrator for the U.S. Fire Administration, was called to help following the attack. He discussed the clean-up effort and the responsibility of civilians during such a crisis. He called attention to the issues that were not publicized but essential in the recovery effort. In addition, he talked about the post-9/11 changes in instruction for policemen, firefighters, etc. in responding to attacks. In addition, he shared how he handled his own feelings after working at the 9/11 site. Kim Davidson, Director, Center for Public Service, Gettysburg College, recently returned from a study tour of El Paso, TX and Juarez, Mexico maintains that current policy toward Mexican and Central American immigrants is based on racism, and that it is made more acute by the lack of transparency in the practices of I.C.E. (Immigration and Customs Enforcement). She suggests several things that advocates can do, including making their voices heard and providing legal services to those wrongly detained. Justine Odila talks about his journey from the Democratic Republic of the Congo to the United States. While in the Congo, he worked to help child soldiers to return to school, their families and mental stability as well as helping other young children to not become soldiers in the first place. This work resulted in him being arrested but he escaped to Zambia where he lived in a refugee camp for 17 years where he carried assisting those around him. After a 5-year vetting process, he was finally able to come to the United States via a resettlement program. He presently works at Walmart, works part-time as a mental health counselor, and attends classes at the community college. Phil Roth talks about his experience as a volunteer in the PAX program sponsored by the Mennonite Church as his alternative service for the military in the mid-1950s. He described the history of the program as well as the challenges for him and his fellow workers. 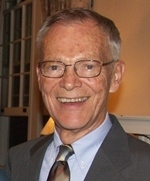 Dr. David Crowner, Professor Emeritus, Gettysburg College and Co-Chair, Project Gettysburg-Leon, describes how charitable organizations can avoid simple charity, if this means patronizing those they serve, and making them dependent; and instead aim for sustainable development. In other words, they help people help themselves. Project Gettysburg-Leon has established eight criteria for this process. Most import is the need to listen and build partnerships.